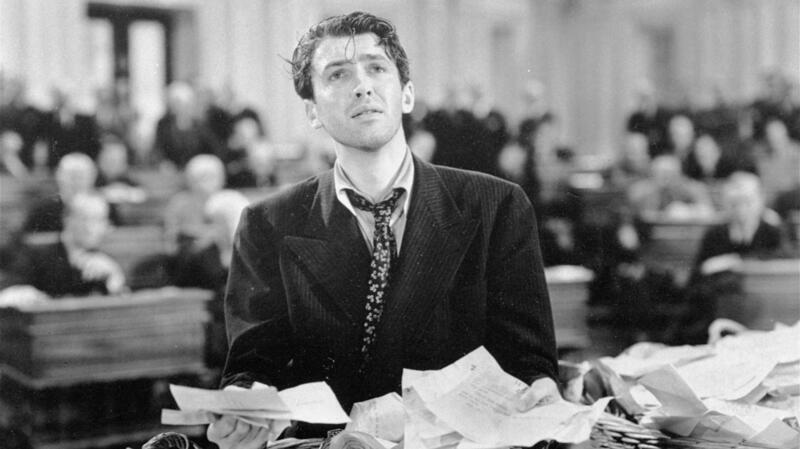 Actor Jimmy Stewart in a scene from the 1939 movie Mr. Smith Goes to Washington, which popularized the notion of a "talking filibuster." Even under changes negotiated in the Senate, the talking filibuster remains a thing of the past. "The changes were broken into two pieces and approved by votes of 78-16 and 86-9. In both roll calls, Republican opponents were joined by Sen. Bernie Sanders, a Vermont independent who usually sides with Democrats. Many of the GOP "no" votes came from tea party-backed senators like Sens. Mike Lee, R-Utah; Rand Paul, R-Ky.; and Marco Rubio, R-Fla.
"The two votes and a brief debate took less than an hour, impressively quick for the Senate. They came after a more typical day that featured a sprinkling of senators' speeches and long periods when the Senate chamber idled with no one talking, while private negotiations off the floor nailed down final details." After threatening to gut the rule that lets a single senator bring the upper house of Congress to a virtual halt with relative ease, Senate Majority Leader Harry Reid, D-Nev., has agreed to tweak rather than transform the filibuster. Reid reached a deal Thursday with the Senate's top Republican, Kentucky's Mitch McConnell, that would put some new limits on how and when a senator can slow or stop action on a bill or a nomination. But the agreement would not come close to requiring a "talking filibuster" — as some Democrats had wanted. That change would have forced senators to continuously debate a measure if they wanted to block an up-or-down floor vote. Democrats now enjoy a 55-to-45 vote advantage in the Senate. Importantly, the changes would not stop the minority party from forcing the majority to muster 60 votes to overcome a filibuster, whose use has become routine in recent years. Since shortly after the November elections, Reid had threatened to push through major changes to the filibuster, and to do so with a simple 51-vote majority if necessary. Republicans argue that changing Senate rules should require a 67-vote supermajority. As of Thursday afternoon, the proposed changes still awaited a vote in the full Senate, but were expected to pass with bipartisan backing because of the blessing of both Reid and McConnell. "Under the accord, Democrats would gain the ability to skip a procedural step, which is called the 'motion to proceed,' to begin debate on a bill. In exchange for that power, Reid has agreed to allow the minority the chance to offer at least two amendments to such fast-tracked legislation. (Democrats could offer two amendments, as well.) Republicans have [chafed] under a practice in which Reid doesn't allow them to offer amendments to bills, which they say has left them little alternative than to filibuster."